For the time being, 22nd Street will have no lane markings. At-Large Councilman Bill Greenlee has rejected two different pavement marking plans prepared by the Streets Department that would have made 22nd Street safer for all users, including motorists. 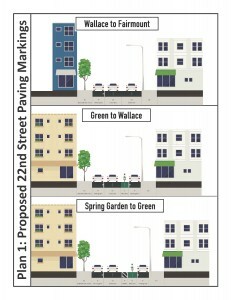 As we reported a month ago, when the Streets Department “milled” 22nd Street earlier this summer, it planned to install a new bike lane on 22nd Street between Spring Garden Street and Fairmount Avenue to help calm traffic and extend the existing bike lane northward to help complete a bicycle connection. When he learned of the Streets Department’s plans (despite hearing from some of his constituents that they supported a bike lane), the Councilman objected. 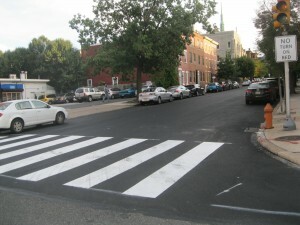 Consequently, the street was resurfaced and crosswalks painted as a temporary measure. Earlier this month, the Streets Department prepared a second pavement marking plan; one that would have channelized the motor vehicle traffic into a single wide travel lane and did not include a bike lane. Councilman Greenlee rejected this second plan as well. 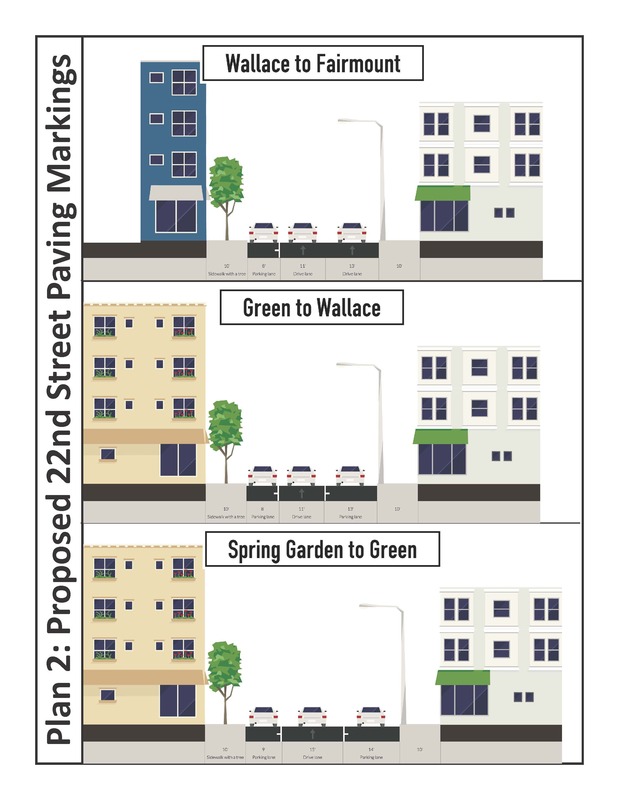 The Streets Department informed us that for the time being, they will only add parking “edge” lines to the four blocks, but do nothing else to the street due to Councilman’s objections. What would these two plans have looked like? The street varies in width across the five blocks, so it would not be uniform. We created a rendering of how the Streets Department’s first proposed plan (Plan 1) would have added in a bike lane and how the second proposed plan (Plan 2) would have channelized traffic into one lane. Single lane with bike lane. Green is for highlighting purposes only. If installed, it would not be painted green. Channelized single lane of traffic only. Why object to a bike lane or traffic calming? By all accounts, Councilman Bill Greenlee objects to any striping of the roadway because he says he is concerned that one travel lane is not enough to handle the volume of cars and buses that use 22nd Street. Additionally, he says several residents have expressed to him their opposition to a bike lane or one wide travel lane. We know that there exists neighborhood support for the bike lane, as several (presumably different) neighbors have expressed their support to Councilman Greenlee and Council President Darrell Clarke, then informing us that they did so. Our requests for a meeting with Councilman Greenlee and a public meeting for him to hear from all near neighbors were both refused. Streets Department engineers determined that 22nd Street would be safer if it was striped as one lane. Councilman Greenlee believes he knows better. We can reduce motor vehicle crashes, injuries and deaths in Philadelphia through safety improvements on streets like 22nd Street. But, we can’t make progress if Streets Department traffic engineers keep running into City Council opposition. Tell Councilman Greenlee to stop opposing safety improvements for all road users by signing our petition. last time Greenlee was involved in his shenanigans–the requirement that council approve all bike lanes rather than letting streets do it–I called his office in opposition. I spoke to a very nasty woman on the phone who I assume was his LD or some other high ranking aide. I very much doubt she recorded my opposition to the bill in question and passed along my sentiments to Greenlee. So, it is possible that Greenlee has no idea how many supporters there are because that mean/unprofessional woman does not tell him about calls from people who oppose his anti-bike agenda. More families and children are using the Spring Garden St. bike lanes. More families and children are riding to and from school, the park, games at Von Colln Field. Why are you blocking a change that will make their rides safer, and protect the city from more deaths and injuries? If you want families to stay here, make it safe to ride! I am a mom who rides a cargo bike with my kids. I take them to school, grocery shopping, and all over the city. Bicycle Safety is a HUGE deal for my family. I want my children to be able to ride on their own safely and I want to have my space in the road. The right of the road belongs to the individual and not the size of the vehicle. By carving out a space for bikes, the street becomes safer for everyone, drivers, bikes, and peds and studies have shown that bike lanes do not add to car congestion. Going up 22nd street in a car is easy. On a bike you realize that 22nd street is good sized hill and on a cargo bike with two kids its a tough haul. A bike lane would make the uphill climb easier. This is extremely needed for safety and accessibility in Philadelphia. I live in Bella Vista. I have a good friend in Fairmount. I ride up 22nd street frequently. A bike lane is needed. More bike lanes are needed everywhere for that matter. One of the ways that cities increase both population and median income is by adopting current trends in transportation and other aspects of livability. Clearly Philadelphia is fighting with itself right now – does it continue to embrace the “car oligarchy” model, or does it embrace the burgeoning population of all ages who want to reduce vehicular congestion in favor by opting to cycle around the City? Opting to support the former will not dampen the enthusiasm of cyclists, but it will leave the City open to lawsuits that are the clearly foreseeable consequences of the devastating injuries and fatalities that will inevitably occur from failure to update our roadways to include cycling lanes to accommodate the increasing bike traffic. Councilman Greenlee needs to vote in favor bike lanes which protect the safety of cyclists, pedestrians and also car drivers alike. This is a really dumb idea. Please don’t do it! I believe what’s needed is a lesson in civil obediance. Bicyclists, taking the lane as we are entitled, riding as far to the right as is practical and reasonable, each coming to a complete and proper stop with a foot down, looking carefully both ways at every stop sign – as we required to do per PA DOT MVC – to demonstrate the need for reasonable bicycle accommodation on 22nd street north of Spring Garden. This is off-topic, but so is @Jon Shinefeld’s post: bicycles are not cars — you’ll never get bicyclists to drive safely if you want them to do the patently ridiculous complete stop. A bike yielding carefully at a crosswalk is the same as a pedestrian crossing carefully at a red light. hog the street. The curbside has too many daylong parkers. I called his office. Spoke to a woman who was a strong advocate for his position – she’s a believer, not just an employee. According to her, the councilman opposes the striping because it would reduce 22nd street to a single lane and cause congestion far into north philly. When I asked about his prior opposition to bike lanes, she insisted that the councilman isn’t opposed to bike lanes – he just wants a comprehensive plan instead of the haphazzard piece by piece approach to bike lanes the city is currently taking. He feels that without council’s approval of such a plan, the executive branch’s creation of bike lanes on a case by case basis without council approval is an overstepping of authority. The councilman feels as if 22nd street is inappropriate for a bike lane because the use of the road is inconsistent with bike traffic. The councilman also reports that business local don’t want a bike lane because it would cut into parking. She also told me that the councilman is being unfairly vilified by a handful of angry cyclists that don’t represent the majority view. Streets that aren’t ordinarily suitable for bikes are the streets that need bike lanes the most. After all, unless its a highway, the bikes are allowed there. I asked her to consider the parkway. The fast thigh volume traffic could make it near impossible to safely bike – and on that point, she agreed cyclists should probably stay off the parkway – except then i pointed out that i ride the parkway all the time because the bike lanes make an otherwise unsafe road safe enough. I suggested that a high volume street needs bike lanes more than a slow low volume street that you’d typically think bike traffic ought to use because the high volume street is where drivers and cyclists need guidance negotiating their rights of way. and we both have them. and, with that logic, she told me she’d pass my feelings along to the councilman and terminated the call. It would be great if the streets department did their job. That job requires an actual traffic study be done to calculate the current level of service vs the proposed. 22nd street can be made safer for bikes, so let’s all follow the law and do not park closer than 20′ from a crosswalk or 30′ from a traffic control device (stop sign or light). There is a parking lot around the corner, so why all of the free parking on 22nd street? Maybe we could let the motorists keep their two lanes (and their current level of service) and give the bicyclists a lane too. Lobby the councilman to get some parking turned into a bike lane. If cars are parked too close to the intersections call for a ticket writer to come out (311 or 215-683-9773). There is a bike lane running north on 22nd until spring garden st. Why stop there?